When the Bees take on the Reno Aces on May 3, players will wear commemorative caps and jerseys featuring pink ribbons in support of breast cancer awareness and fans will encouraged to help “Pack the Park Pink” by wearing the color of the night. A highlight of the evening will be a blind auction of the player-worn jerseys and caps with all proceeds benefiting HCF. Following the game, jersey buyers will have the opportunity to meet Bees players on the field for photograph opportunities while collecting their player-autographed jerseys. In partnership with the Bees, Swing for Life will also have pink t-shirts available for purchase with all proceeds benefiting HCF. Gates open at 5:35 p.m. and fans will be treated to a fireworks show following the conclusion of the game. As part of an ongoing effort to honor and thank local educators, the Bees will host “Teacher Appreciation Night” on Tuesday, May 6 when the team takes on the Las Vegas 51s at 6:35 p.m. Admission to the game is free for all teachers when they show their school I.D. at the box office. Teachers may also purchase discounted tickets for family members for just $8. “Pack the Park Pink Night” and “Teacher Appreciation Night” are part of the Bees organization’s year-round community outreach initiatives to support health and wellness, education and youth development. Bees tickets are available at the Smith’s Ballpark box office from 8:30 a.m. – 5:30 p.m., as well as at all Smith’sTix outlets and Smith’s Food & Drug Stores. Tickets may also be purchased online with no additional fees at www.slbees.com or by phone at (801) 325-BEES (2337). The Hickory Crawdads have announced the details for their annual Breast Cancer Awareness weekend, which is scheduled for Friday, May 9th – Sunday, May 11th. The 3-day promotion, presented by KICKS 103.3, will focus on the color pink with the team hoping to raise both awareness and financial support in the battle against breast cancer. The festivities begin on Friday, with the Crawdads looking to “Paint the Park Pink.” The ‘Dads players will debut special pink game jerseys that they will wear throughout the weekend, and any fan who wears pink to the ballpark will receive a $5 ticket to the game. Saturday will feature replica pink Crawdads uniforms for the first 1,000 fans with paid admittance, courtesy of Pepsi. A portion of the proceeds from the jersey auction will go towards a local breast cancer support organization. You can find the online auction page on the Crawdads website here. For more information regarding any of the activities during the Crawdads Breast Cancer Awareness Weekend, call the ‘Dads front office at (828) 322-3000. 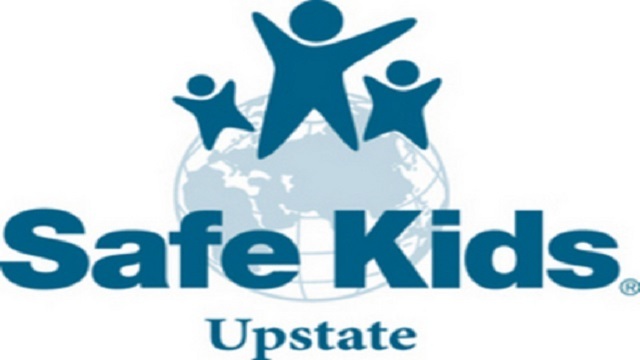 The Drive will host Safe Kids Upstate Night on Wednesday, May 7th at Fluor Field. Safe Kids Upstate is an organization whose mission is to prevent accidental childhood injury, a leading killer of children 14 and under. Led by the Children’s Hospital of Greenville Health System, Safe Kids Upstate and its Safety Patrol members will be celebrated at Fluor Field. Prior to the game members of Safety Patrol from across the Upstate will participate in a “Parade of Champions” around the Fluor Field warning track. Safe Kids Upstate will also be providing complimentary bike helmets to the first 300 children through the gates at the ballpark. Each child receiving a helmet will be properly fitted for one their size. First pitch for Wednesday is at 7:05 PM, with gates to Fluor Field opening at 6:00. To purchase tickets visit the Main Street box office, call (864) 240-4528, or log onto GreenvilleDrive.com. City Stadium Will See Purple on May 2nd! 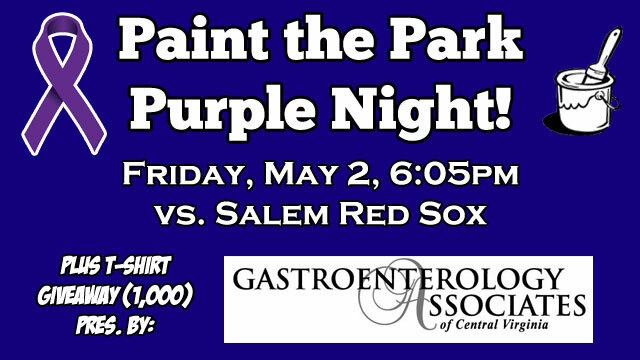 The Lynchburg Hillcats are teaming up with Relay for Life of Lynchburg and the American Cancer Society on Friday, May 2nd at 6:05pm for the 3rd Annual Paint the Park Purple Night and T-Shirt Giveaway for the first 1,000 fans presented by Gastroenterology Associates of Central Virginia! Gates will open at 5pm and general Admission Tickets for the game will be $10 with a portion of every ticket sold benefiting the American Cancer Society. Relay for Life of Lynchburg will be held on May 30, 2014 at Heritage High School and is an overnight relay style walk-a-thon that raises money for the American Cancer Society, as well as honors cancer survivors and remembers those lost to cancer. Local participants have been able to sell tickets to Paint the Park Purple Night as a part of their fundraising for their relay team. Fans will also be able to participate in a 50/50 raffle during the game, proceeds of which will also benefit the American Cancer Society. Approximately 1,596,000 people were diagnosed with some form of cancer in the United States last year and it is estimated that over 41,000 new cancer cases will be reported in 2013 for the state of Virginia alone. The American Cancer Society raises funds worldwide for research programs to find cures for all forms of cancer, and helps those diagnosed to find treatments and support. Visit www.cancer.org to learn more about staying healthy and preventing cancer, as well as ways to donate or volunteer. The Hillcats thank the following Paint the Park Purple sponsors: Gastroenterology Associates of Central VA (Title Sponsor); Appalachian Orthodontics of Lynchburg; Cintas; Merrill Lynch; 97.9 FM The Planet; Scott Insurance; STEVE FM; Star Country/Q99/K92/WLNI; Virginia Foam Insulators; Westover Dairy; WIQO/ESPN Radio. To purchase tickets for the Paint the Park Purple Night, fans can call the box office at (434) 528-1144 or go online. Ticket purchases can also be made in person at the Lynchburg City Stadium Ticket Office (Mon-Fri, 9am-5pm). In an effort to accommodate baseball fans whose peanut allergies prevent them from attending games, the New Orleans Zephyrs are hosting a peanut-free night on Tuesday, May 6. Though the song says “Buy me some peanuts and Cracker Jack,” Zephyr Field will be peanut-free when the Z’s open a four-game series against the Iowa Cubs, sponsored by AllerGease. Fans with peanut allergies are often prevented from attending games due to high risk of exposure in stadiums. According to Food Allergy Research & Education, roughly 3.3 million Americans suffer from peanut allergies. Studies have shown the number of children living with peanut allergies has tripled since 1997. For more information or to purchase tickets, contact the Zephyrs at (504) 734-5155. This article originally appeared on the official website of the New Orleans Zephyrs. Click here to view the original story. The Williamsport Crosscutters are proud to announce the launch of Bully Busters Unite, a new anti-bullying program aimed at raising awareness for a priority issue in local elementary schools. The program, underwritten by Susquehanna Health, utilizes the star power of the team’s beloved mascot “Boomer”, who will engage students in recognizing bullying behavior and exploring what to do should they witness or experience bullying of any kind. The Crosscutters will provide free school assemblies and incentivize students with the goal of making a strong impact in the fight to stop bullying before it starts. Developed with the assistance of Bruce Productions, a production company based in Wilmington, Delaware, the Bully Busters program kicks off this May in Williamsport area schools and continues this fall in elementary schools throughout the Susquehanna Valley. Each assembly will star “Boomer” and Cutters staff members, who will engage students in recognizing bullying behavior and exploring what to do should they witness or experience bullying of any kind. At the conclusion of each interactive assembly, students will be asked to take the “Bully Buster Pledge” both in school and at home with their families. Students who do so will be rewarded with two complimentary tickets to a select Cutters game in June. The Crosscutters will also provide teachers and counselors with a take-home activity book for students, further reinforcing the importance of the anti-bullying message. 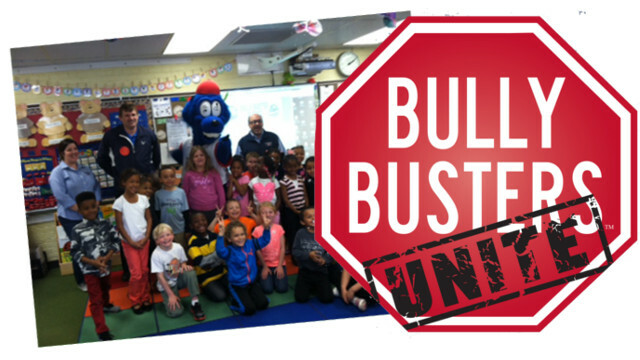 School administrators interested in booking a Bully Busters Unite assembly can contact Sarah Budd, the Crosscutters Director of Community Relations at (570) 326-3389 x1200 or sarah@crosscutters.com. The Crosscutters 2014 season opens on June 13 at Susquehanna Bank Park at Historic Bowman Field. Season tickets, bonus books and group packages are currently available and can be purchased online at www.crosscutters.com or by calling the Cutters at (570) 326-3389. 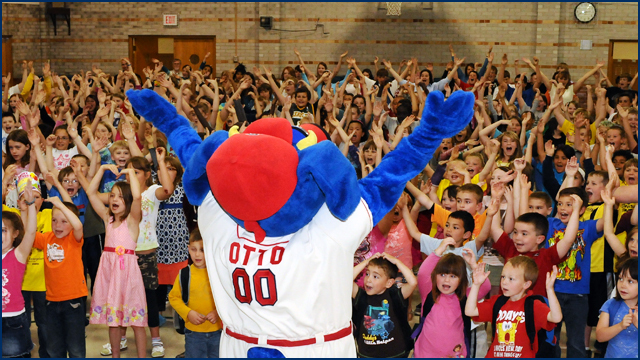 Bemiss and Sheridan Elementary will get a visit from OTTO the Mascot. For the fifth consecutive year, the Spokane Indians and Itron will partner for the Itron Champions Program, which rewards low-income Spokane schools with a visit from OTTO the Mascot, a school assembly and 250 Indians tickets to distribute to their students as a reward for good attendance, hard work and achievement in the classroom. Bemiss Elementary and Sheridan Elementary have been chosen as this year’s recipients. Bemiss Elementary will have their assembly on Friday, May 9th at 2:00 PM. Sheridan Elementary will host theirs on Friday, May 30th at a time to be determined. The Spokane Indians would like to thank all of our fans for their support during the record-setting 2013 season. The Indians are the Short Season Class “A” affiliate for the Texas Rangers. Ticket packages are on sale now for the 2014 season, and start as low as $63. Reserve your seats today by calling the Avista Stadium Ticket Office at (509) 343-OTTO (6886). Parking at all Spokane Indians games is FREE! General Manager Dave Echols has announced that the Charleston RiverDogs will be participating in Minor League Baseball’s “Winning with Doubles” fundraising campaign to benefit Big Brothers Big Sisters of Carolina Youth Development Center. Fans can participate by visiting the “Winning with Doubles” site (www.MiLB.com/give), select the Charleston RiverDogs as their team, and pledge the amount they would like to donate for each double hit by a RiverDogs player in April and May. Bigs and Littles will be attending the RiverDogs game on Friday, May 16, against the Hickory Crawdads. First pitch is set for 7:05 pm. The RiverDogs plan to have the Bigs and Littles stand on the field with players and coaches before the game and will donate items for a BBBS raffle. One lucky Little will throw the ceremonial first pitch. Another opportunity for fan participation will be at the May 16 game when fans can purchase tickets for the BBBS raffle. 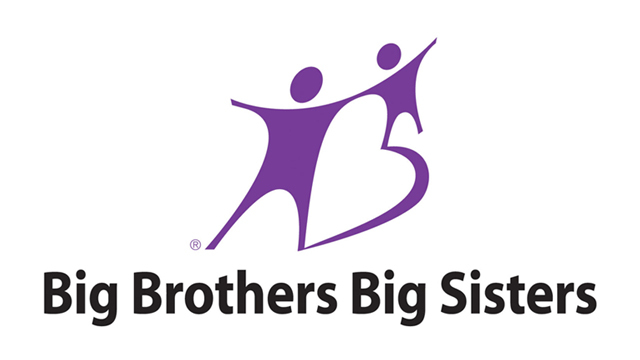 “We hope that by creating further awareness for Big Brothers Big Sisters of Carolina Youth Development Center and the need for more caring adult mentors here in the Lowcountry, we will encourage people to become involved in the program by applying to volunteer as a Big,” said Echols, who is a longtime member of their board of directors. For more information about BBBS, please contact Program Director Mandy Scherer at 843/266-5232 or at mtscherer@cydc.org or Louis Kines, AmeriCorps Vista at 843/266-5239 or at lkines@cydc.org. The Rome Braves and Blood Assurance are presenting a Meet the Team Pancake Breakfast on Saturday May 10th from 8 a.m. until 10 a.m. at the Three Rivers Club Restaurant at State Mutual Stadium. 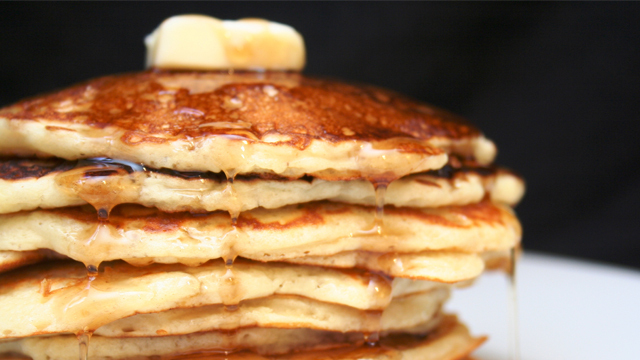 Tickets are just $8 and that includes all you can eat pancakes, sausage, coffee and juice. Half the team and staff will be autographing from 8-9 am and the other half will be out from 9-10 am. Romey and Roxie will be available for photos & autographs as well. Blood Assurance will be hosting an onsite Blood Drive during these hours. For more information please call the Braves at 706-378-5100. The 2013 South Atlantic League Champion Sand Gnats were fantastic to watch throughout last season. While their pitching was dominant from Opening Night through the League Championship, one offensive stat will pay dividends for school children in the Savannah area. Thanks to a generous pledge from Thomas & Hutton and 116 doubles at Historic Grayson Stadium from the potent Gnats’ lineup, Jacob G. Smith Elementary will receive a $2,900 technology grant. Thomas and Hutton will present the check to the school on the field at Historic Grayson Stadium just before the Sand Gnats game on Friday, May 16. J.G. Smith Elementary was named a “Title I Highest-Performing Reward School” in 2014 by the Georgia Department of Education and is ranked among the top five percent of Title I schools in Georgia, having the highest absolute performance over three years for the “All Students” group on the statewide assessments. The grant will be used for the school to purchase Chromebooks, providing second grade students and their teachers the opportunity to utilize another technology resource that will enhance instructional practices in reading and math and help students prepare for testing such as the Scholastic Reading Inventory (SRI) and Measures of Academic Progress (MAP). Additionally, students will be more prepared for the Criterion-Referenced Competency Tests (CRCT) which begin in the third grade. This article originally appeared on the official website of the Savannah Sand Gnats. Click here to view the original story. The Midland RockHounds/Sockers FC will be awarding four $1,000 scholarships to graduating seniors for the 2014 Fall College Semester. Two of the scholarships are reserved for students entering the field of Sport Management or involved in sports, and the other two will be for any field of higher education. The scholarships will be available only to students who attend Midland or Odessa public and private high schools. This will be offered to any student attending a four-year college, junior college, vocational, technical, or health-related college. The four applications that best suit our prospectus will be granted the scholarship starting with the 2014 Fall Semester at any Texas or out-of-state college. All recipients will be honored on the field during a RockHounds or Sockers game of their choosing. This is a one-year, non-renewable scholarship funded through the West Texas Sports Banquet. Extra copies for those interested in applying will also be available in our Security Bank Ball Park Office and on the link above. Check back for the 2015 application. 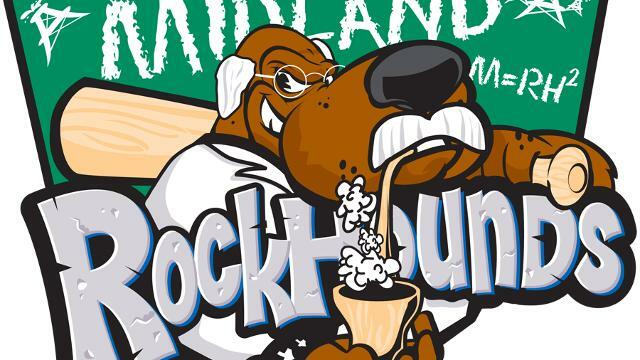 This article originally appeared on the official website of the Midland RockHounds. Click here to view the original story. 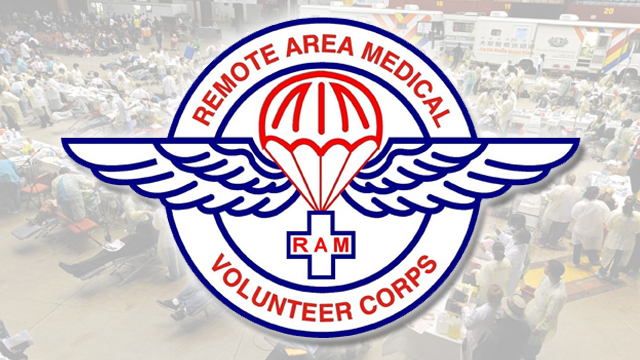 The Tennessee Smokies announced today the Remote Area Medical® (RAM®) as the team’s “charity of choice” for the 2014 season. Proceeds from jersey auctions and additional activities at Smokies games this year will benefit the non-profit organization financially and provide a platform for RAM® to make its mission better known in the community. Remote Area Medicial® was founded in 1985 by Stan Brock, who developed the idea for the organization after a medical ordeal in South America while being isolated from urgent care. After returning, it was Brock’s mission to establish the non-profit in order to help bring medical aid to those living in the isolated and underserved communities in the U.S. and abroad. Brock starred on the popular television show Mutual of Omaha’s Wild Kingdom, with the program winning four Emmy Awards, and went on to create, direct and star in Stan Brock’s Expedition Danger for eight years. He has written three books on his experiences, scribed articles for Reader’s Digest and Outdoor Life, and featured in TIME Magazine. According to the organization’s website, over 80,000 volunteers and healthcare professionals have helped deliver more than $75 million dollars of free quality medical services since RAM®’s founding in 1985. Fifth Third Bank and the Dayton Dragons have partnered with the The Foodbank, Inc. in efforts to assist families fighting hunger in the Miami Valley. From April 28-May 1, from 5:30-7:00 p.m. on the plaza at Fifth Third Field, donations of canned goods and non-perishable food items will be accepted. Items will be donated to The Foodbank, Inc. to provide meals for those in need. Please help Fifth Third Bank reach their goal for Fifth Third Day (May 3) of providing 530,000 meals for the hungry. For more information, visit daytondragons.com. You can text MEAL to 41444 to give a one-time or recurring gift by credit card. This article originally appeared on the official website of the Dayton Dragons. Click here to view the original story. The New Hampshire Fisher Cats and Citizens Bank have teamed up this season to bring the Fisher Cats entertainment experience on the road! Later this season, the Fisher Cats will ‘Take the Show on the Road’ to one youth baseball league’s local field. The Fisher Cats will bring their inflatable games, mascot, PA Announcer, promo team, and turf manager to create the fun and exhilarating entertainment that everyone is used to at each Fisher Cats home game. The winning league will also be rewarded with 100 tickets to a Fisher Cats game where they will be recognized as the winner of the ‘Take the Show on the Road’ promotion presented by Citizens Bank. Three lucky entrants will also be selected at random to receive 25 tickets to a game with a VIP Ballpark Tour and the opportunity to meet Fisher Cats players, or one luxury suite rental with 18 tickets and two VIP parking passes. Leagues are encouraged to send in an application stating how their league exemplifies sportsmanship and why they should be considered to have the Fisher Cats entertainment experience at their local field. Leagues interested in applying can download applications and fliers at the Fisher Cats’ ‘Take the Show on the Road presented by Citizens Bank’ webpage at www.nhfishercats.com. If you have any questions about ‘Take the Show on the Road presented by Citizens Bank,’ please contact Mike Ramshaw, Senior Vice President of Sales, at 603-606-4187 or mramshaw@nhfishercats.com. The Dayton Dragons and Cohen Recycling will be teaming up to help Miami Valley residents recycle unwanted electronics for free. Cohen Recycling will be collecting unwanted electronics on August 2 on the Fifth Third Field Plaza. Recycle your old computers, cell phones and other unwanted electronics! Bring them to the plaza at Fifth Third Field on August 2 from 2pm – 6pm and Cohen will do the rest. You can meet the Dragons mascots, Heater and Gem, and the Green Team! Kids can play some inflatable games, get balloon animals and glitter tattoos. Each car will get a FREE Dragons t-shirt and an entry to win a “VIP Experience”, which includes a behind-the-scenes tour, an opportunity to throw out a first pitch at a game, or a trip for two for an amazing vacation. For a list of items that you can recycle, visit daytondragons.com. 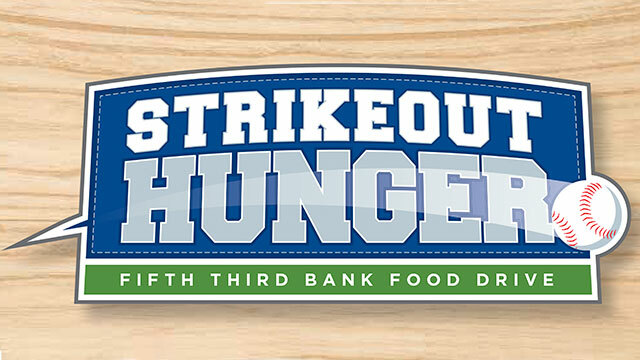 Today, Fifth Third Bank (Georgia) announced it is going to bat with the Augusta GreenJackets – to launch Strike Out Hunger! This community food drive will run from April 18 through May 3 (“Fifth Third Day” on 5/3) and is aimed at collecting enough products to feed 5,300 families in the Atlanta Metro area. Members of the community are encouraged to donate non-perishable food items – such as canned fruits and meats, peanut butter and boxed cereal – to participating Fifth Third Bank financial centers. While supplies last, the bank will give baseball game tickets to those who make a contribution to the food drive, courtesy of the Augusta GreenJackets. After the month-long food drive, the bank will deliver food donations to the Golden Harvest Food Bank, which will in turn feed thousands of families. To take part in fighting hunger and receive tickets to the Augusta GreenJackets vs. Greenville Drive on Saturday, May 3, 2014 at 7 p.m., residents can drop off food donations at financial centers in Martinez and Augusta from April 18 through May 3. ** Disclosure: NO PURCHASE NECESSARY. Offer available only at participating Fifth Third locations. Offer valid April 18, 2014 – May 3, 2014. Donations may be made during regular business hours. Limit one ticket per donated item with a maximum of four tickets per person. Offer good only while supplies last. Food collection bins are set up at all 32 Fifth Third financial centers in the following counties: Columbia, Richmond, Fulton, DeKalb, Gwinnett, Walton, and Cobb. Location addresses are available at 53.com. Golden Harvest Food Bank is a volunteer-driven, non-profit organization that provides quality food and other grocery products to those in need. We do this with local community support through direct service programs, food pantries, and community education about hunger. The Food Bank was founded in Augusta, Georgia, in 1982, and now operates from three distribution centers – Augusta, GA and Aiken and Liberty, SC. Golden Harvest is a locally-supported 501(c)(3) nonprofit organization that provides grocery products to the hungry through direct service programs and a network of more than 300 food pantries and soup kitchens. Golden Harvest distributed more than 16.2 million pounds of grocery products to those in need in fiscal year 2013. Golden Harvest Food Bank is a member of Feeding America. For more information on how you can help eliminate hunger in our community, visit www.goldenharvest.org. You can also find Golden Harvest on Facebook and Twitter. Your South Bend Silver Hawks on Sunday, May 18th will provide a peanut free area located in the Home Plate Suite in recognition of Food Allergy Awareness Week. Food Allergy Awareness Week helps educate the public about food allergies, a potentially life-threatening medical condition. Allergy to peanuts appears to be on the rise in children; more than 3.5 million Americans suffer from it. There are 8 types of food that are responsible for more than 90% of allergic reactions, peanuts being one of those 8 foods. “I am excited that we are able to do this again in 2014. 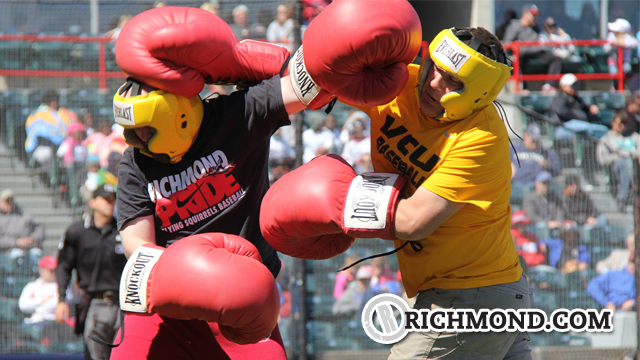 Last year’s event was a huge hit and we were able to provide a fun day at the ballpark that many people were not able to experience in the past. We had one family in which their son had never been to a professional baseball game before because of his peanut allergies. We want to make sure everyone has the opportunity to experience a Silver Hawks game, so we will do whatever we can to make it a reality. Because of last year’s success I expect the tickets to sell out quickly and as result, we have already started looking at dates for an additional night.” states Joe Hart, Team President. Tickets can be purchased through the Silver Hawks’ Box Office for $17.00; space is limited to the first 50 people. Price includes a game ticket, hot dogs, hamburgers, chips and soft drinks. Call the Box Office at 574-235-9988, or stop by the Box Office, located on W. South Street to purchase tickets for the peanut free suite. The South Bend Silver Hawks are a Class A minor league team affiliated with the Arizona Diamondbacks. The team is owned and operated by Swing-Batter-Swing, LLC whose sole shareholder is Andrew T. Berlin of Chicago, IL. To purchase tickets to a game visit www.SilverHawks.com , call the Box Office at 574-235-9988, or stop by between 10:00a.m.-5:00p.m. This article originally appeared on the official website of the South Bend Silver Hawks. Click here to view the original story. Minor League Baseball™ Charities announced today that it is donating $10,000 to the United Way of Snohomish (Wash.) County’s Disaster Recovery Fund to aid in the relief efforts related to the March 22 mudslide in Oso, Wash. More than three dozen people have lost their lives and several others are still missing as a result of the devastating incident. The mudslide occurred just 30 miles from the Everett AquaSox, a Minor League Baseball club in the Northwest League. “Through MiLB Charities, we are able to give back and offer support to the communities in which our clubs are a part, especially in times of need when natural disasters like the Oso mudslide occur,” said Tina Gust, MiLB™ Vice President of Business Development. The AquaSox will present the $10,000 check, on behalf of MiLB Charities, to the United Way of Snohomish County on Friday. A formal check presentation will be made to the organization prior to an AquaSox game this summer. The club is also donating all walk-up ticket sales from its June 16 game to the relief and recovery efforts. Through donations and support it receives from fans, teams and partners, MiLB Charities is able to contribute to local organizations in times of need and support causes that are important to its extended baseball family. Minor League Baseball Charities is a tax exempt, 501(c)(3) charitable organization affiliated with the National Association of Professional Baseball Leagues. Visit http://milbcharities.milbstore.com to make a tax-deductible donation to MiLB Charities or http://charities.milbauctions.com for additional opportunities to show your support. This article originally appeared on the official website of the Class A Short Season Northwest League. Click here to view the original story. The Everett AquaSox announced today that they are dedicating their June 16 game towards relief efforts related to the Oso mudslide. All walk-up ticket sales from this game will go directly towards relief and recovery efforts caused by the mudslide that occurred only 30 miles from the AquaSox on March 22. In conjunction with the AquaSox’s efforts, Minor League Baseball™ Charities, a tax exempt, 501(c)(3) charitable organization affiliated with the National Association of Professional Baseball Leagues, has donated $10,000 to the United Way of Snohomish County’s Disaster Recovery Fund for Mudslide Relief. The AquaSox will present the check to the United Way of Snohomish County on behalf of MiLB on Friday, April 25th. “We are very appreciative of Minor League Baseball and the support they have offered to our community through this generous donation,” said Backemeyer. A formal check presentation to the United Way will be made prior to an AquaSox game later this summer. To donate directly to the United Way’s Disaster Recovery Fund, and to find out how else you can help, please visit www.uwsc.org. 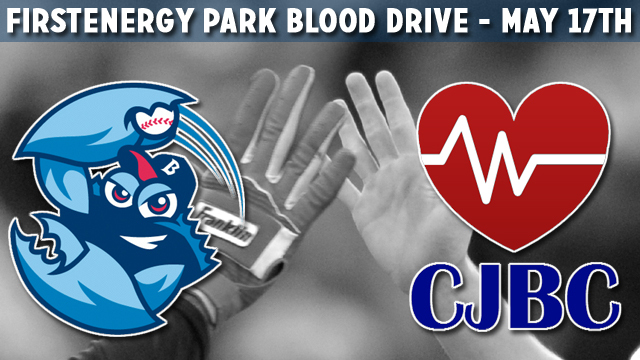 The BlueClaws and Central Jersey Blood Center will partner on a Blood Drive on Saturday, May 17th that runs from 7 am – 2 pm. The drive will take place in a blood mobile located outside the ballpark, and each donor will receive a pair of tickets to a future BlueClaws game. The BlueClaws and Central Jersey Blood Center encourage all fans to donate, as this is the time of the year when donations are in the greatest need. To register online, click here. Donors can also register by calling 732-842-5750 ext. 225. Don’t Forget: Please eat before donating. All equipment used during the procedure is sterile and disposable. Donors must be healthy, be at least 16 years of age and weigh at least 120 pounds. Donors must present signature ID. The Myrtle Beach Pelicans, Class A-Advanced affiliate of the Texas Rangers, are working with HTC for a second straight season to bring Backpack Buddies Monday to TicketReturn.com Field at Pelicans Ballpark. The program invites fans to bring certain essentials to the ballpark for donation on Monday home games. Those donating will receive half-price admission on their Monday game ticket. Starting in 2004, the Backpack Buddies program aims to provide schools with nutritious, child-friendly, self-serve food designed to put in a backpack and feed a child over the weekend. The program began with a pilot program of approximately 300 children. Now, a decade later, the program provides over 1,500 meals a week across Horry County. The Pelicans are pleased to bring back the program after a successful first year with a valued partner in HTC. To participate, fans can bring the following items to Monday night home games for half-priced admission: powdered drink mix, Ramen Noodles, Pop Tarts, individual servings of pudding, individual servings of apple sauce, fruit cups, jelly (plastic container), peanut butter (small jars), Beanie Weenies, Vienna Sausage, canned meats, cereal, raviolis (pop-top cans), mac and cheese, snack crackers, chicken noodle soup (pop top cans), and unopened containers of mustard, ketchup, and mayo. Team has contributed more than $500,000 since 2007. As part of the sponsorship, the Bisons support the ‘Junior Bisons’ team that plays in the CEBA. As part of the Buffalo Bisons‘ long-standing sponsorship of the City of Buffalo Public High School baseball program, City high school games will return to Coca-Cola Field starting this Saturday, April 19. The Bisons wide-ranging sponsorship, which enters its eighth year in 2014, has successfully revitalized the game within Buffalo Public High Schools as well as prepared young athletes to compete at the collegiate level. The year’s games begin Saturday, April 19 (10 a.m.) at Coca-Cola Field as City Honors hosts Nichols High School (schedule below). Since 2007, Bisons owners Bob and Mindy Rich have contributed nearly $500,000 towards the enhancement of high school baseball throughout Buffalo’s Public High Schools. The Bisons support for the program includes providing team uniforms, paying league and umpire fees, funding stipends for assistant coaches for each Buffalo Public High School team and the use of Coca-Cola Field’s diamond and indoor batting cages year round. Additionally, $250,000 was provided for the renovation of Johnny B. Wiley Stadium, providing the City of Buffalo a top-notch athletic facility for their teams to play in and for the community to share. 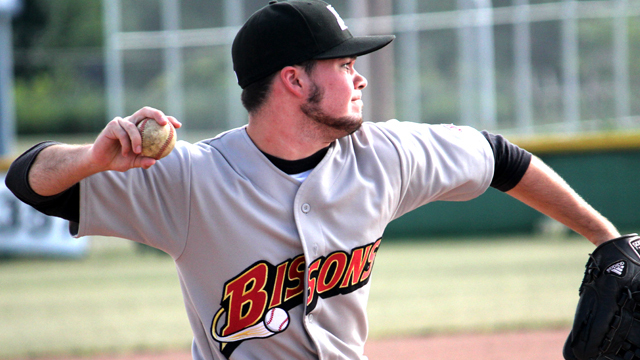 Part of the Bisons’ adoption also includes the formation of the Junior Bisons baseball team. The top players from each of the City of Buffalo high schools are joined together to compete in the County of Erie Baseball Association (CEBA) throughout the summer. The focus of the team has always been team-building, fundamentals and life skills teachings. The Junior Bisons have made the post season four times and two former Junior Bisons are currently playing baseball at the collegiate level. McKinley vs. Maritime CS (Tuesday, April 22 -4 p.m.). This article originally appeared on the official website of the Buffalo Bisons. Click here to view the original story. CLICK HERE to download a Baseball Camp Registration Form! 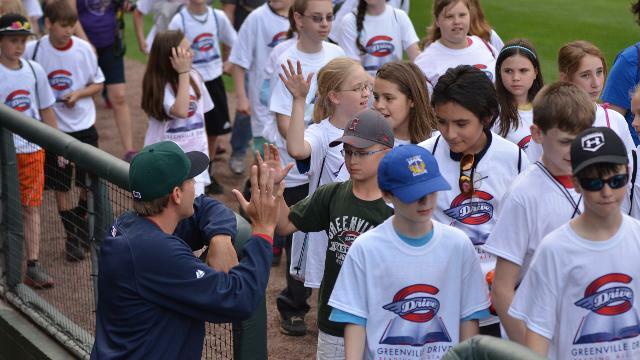 The Gwinnett Braves are set to bring back Youth Baseball Camps for the 2014 season. The G-Braves will be holding their annual three-day baseball camps at Coolray Field in June and July. There will be two separate three-day camps. The first session will run from June 24-26, while the second and final session will go from July 21-23. G-Braves’ players and coaches will teach kids what it takes to become the best ballplayer they can be. Campers will learn basic fundamentals like hitting and pitching and specialized skills like bunting and base running. The camp is open for kids ages 8-14 and will run from 9 AM to 12 PM each day. Each participant will receive a T-shirt at the beginning of camp and will be served lunch at the conclusion of each session. On the final day, the players and coaches will gather for an autograph session with the kids. In addition to the instruction and player interaction throughout the three days, each camper will receive two Field Box Tickets for a Gwinnett Braves home game and will get to take the field as part of the “High Five Tunnel” prior to the game action. For more information or to reserve your spot, contact Gwinnett Braves Community Relations Trainee Alison Atkins via email at alison.atkins@braves.com. The Gwinnett Braves, Triple-A affiliate of the Atlanta Braves, return to Coolray Field on Saturday, April 19 for a 7:05 PM game against the Charlotte Knights. Tickets for all home games are available for purchase now by calling the Coolray Field Ticket Office at 678-277-0340 and by visiting GwinnettBraves.com. The Greenville Drive and Michelin, N.A. are thrilled to celebrate the Reading All-Stars of Greenville County elementary schools and all Pickens County schools before and during Tuesday night’s game against the Asheville Tourists at 7:05. The Drive’s seventh annual reading incentive program is designed to encourage learning and education success through reading, and the program reaches over 75,000 students year-round. To honor these Reading All-Stars for their hard work this school year, they will take part in a pre-game “Parade of Champions” around Fluor Field at 6:30 that celebrates their success in the program, and will be recognized with a Drive/ Michelin Reading All-Stars t-shirt. During the game, five schools with continued success in the program will be inducted into the inaugural Reading All-Star Hall of Fame, and top performers for the school year will be recognized. In addition, students will participate in the in-game entertainment, including a tug-of-war, shoe scramble, sack race and more! For more information about the celebration game on Tuesday, click here.